A major research study “Wellness Matters: Health and Wellbeing in offices and what to do about it” by The British Council for Offices (BCO) is being launched today. The study critiques existing Health and Wellbeing measurement and certification, identifies the most recent and relevant medical evidence justifying a proactive approach to Health and Wellbeing in the built environment, and articulates the business case for investment in this space beyond simply improving productivity. Most significantly, this research delivers a practical and professional guide to creating a healthy environment across the different stages of a building’s life cycle, from design, construction and leasing to the most important aspect by time and value: occupation and asset management. The report has been led by a consortium of Sentinel RPI, Elementa Consulting, Perkins +Will and Will+Partner’s, backed by medical and academic input from Royal Brompton, Imperial College and Queen Mary University. Evidence was reviewed from the USA, Europe and Globally. The findings inform the next BCO Guide to Specification, which is the industry-recognised standard for best practice in office development across the UK, also due to be published in early 2019. Elaine Rossall, Chairman of the British Council for Offices’ Research Committee, commented: “The health and wellness agenda is, rightly, growing in importance and prominence. 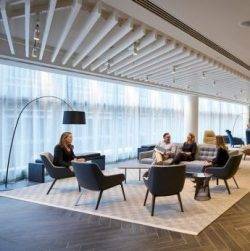 ‘Wellness Matters’ responds to this and provides practical advice to BCO members on the issues surrounding Health and Wellbeing in offices and what they can do about it. Highlights from the study include its lessons for government. In creating the Wellness Matters Roadmap it became clear that the benefits from improved office wellness – and the costs of a failure to act – flow not only to individuals and organisations, but also to communities and the country as a whole. These impacts can be quantified, for example through reduced costs of health and social care and increased productivity. With wellness standards largely emanating from the USA and a low profile afforded to the research and guidance developed in the UK, we risk undervaluing the deep expertise in British public health, workplace wellbeing and medical research. Yet substantive national guidance on workplace Health and Wellbeing exists – published by bodies such as the NHS, Public Health England and the Health & Safety Executive. Our understanding of wellness is constantly evolving, the pace of change has been accelerated by the revolution in data collection and analysis. Transparency and disclosure is driving the industry towards refurbishment of the worst performing existing buildings to move them from sickness to health. Businesses that invest in Health and Wellbeing are reaping the rewards of increased productivity, lower costs from illness and enhanced reputation. Legislation and regulation will evolve, closing the gap between best practice and business as usual. Greater awareness of the health impacts of materials within buildings, and upon those that produce them, will transform supply chains.